Community Planning - DELTA DEVELOPMENT GROUP, INC.
﻿Delta’s Community Planning team supports public and private organizations that have an interest in economic growth, comprehensive long-range planning, and sustainable community development. With each of our engagements, we provide an outside perspective that addresses the unique underlying factors of community and economic viability. In this approach, we foster an environment where public and private interests actively participate in project planning, decision-making, and implementation. "Chosen for their knowledge on policy, planning, process, and funding, Delta's team brought connectivity to every element of Messiah College- far beyond the scale of buildings and stewardship of land." ﻿Understanding a community’s role in a regional and global economy is at the center of Delta’s economic development and revitalization strategies. Our work has assisted in repositioning communities in the marketplace and revitalizing downtowns and commercial corridors. We assist clients in defining their strengths and opportunities, and recommend strategies that leverage key assets for economic growth. What is the community’s competitive advantage? Who is the target market and what are the gaps in business and industry? What types of development can be supported by consumers? Questions like these are commonly answered through Delta’s in-depth assessment and analysis of a community’s market potential. 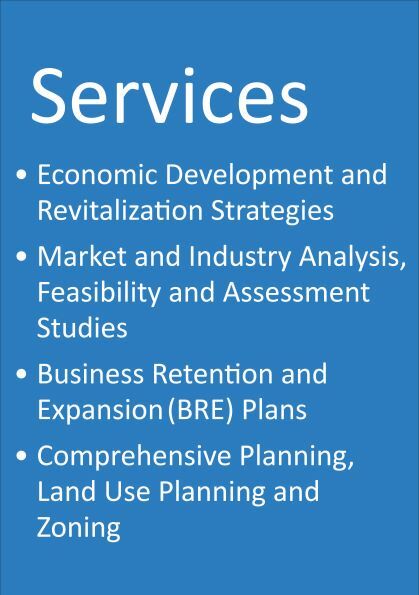 Our analyses have provided the foundation for real estate development, revitalization strategies, and public funding initiatives. ﻿From residential to new business and industrial park development, Delta’s feasibility and assessment studies have assisted communities in developing strategies to strengthen housing markets and create new business opportunities. Strengthening the economic base for communities is the key goal of Delta’s BRE plans and strategies. Our work begins with identifying key strengths and weaknesses, surveying business and industry stakeholders, and identifying industries that may be at risk. Our BRE plans also include an in-depth market analysis. Delta assists municipal clients with the development of comprehensive plans, new zoning ordinances, and land use plans. Helping our clients understand and solve critical issues provides the foundation for structuring plan recommendations.